Guy Gunaratne is recognised for his work as a video artist, filmmaker, video journalist and some writing. 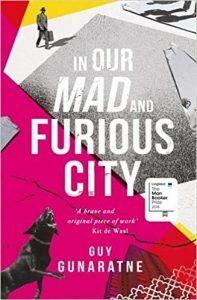 In Our Mad and Furious City, however, is his debut novel which has garnered a lot of buzz, having already been long-listed for the Booker and short-listed for the Goldsmith and Gordon Burn prizes. Set in London, Gunaratne’s novel tells the story of five different characters as they come to terms with the killing of a British soldier, which causes riots in the city. In particular the book centres around three youths – Selvon, Ardan and Yusuf – as they grow up on Stones Estate. When a writer chooses to tell a story with a multitude of perspectives, the narrative point of view is often varied, but there’s a danger that the voice of each character can become indiscernible. In this respect, Gunaratne makes firm narrative choices and offers variety in voice and speech vernacular of London. For instance, the speech used by Nelson is created to show that his English is not that of a native speaker, but it also creates authenticity and makes the reader connect with Nelson and his story: ‘Memory come. Sorta duff-duff, sorta slide. It come loose and fall out of my mind like that. Come thick’. While writing in a vernacular style is not especially innovative, Gunaratne’s command of it is. The author has a keen sense of rhythm and lyricism with his narrative styles. Many times, I found myself reading lines again and noticing a certain beat to the characters’ dialogue. The strongest examples of this attention to rhythm come from the vernacular used by the three youngsters. The lads’ lives on the estate blocks revolve around the things you might expect, like football and music. I found a certain musicality to these sections of In Our Mad and Furious City which I had not come across before. The rhythm and poeticism of the speech rings off the page and reflects the thrum of the rap music the young boys listen to: ‘we’ll play longways today, ennet. Longways and narrow like Highbury. Feeling it today. Yes, proper on it today’. With the variety of voices and vastly differing characters, Gunaratne strives to create a London that is true to its multi-cultural make-up. While this does a great deal to serve the authenticity of his characters, he also uses it to illustrate how each character experiences the events of the novel. Gunaratne achieves this by keeping some accounts short, snappy and dynamic: ‘Boy the call me, Boy this, Boy that. Was true I was much younger than most of them’. The range of characters touches on how each is affected by serious issues such as racism and violence and is effective in doing so. The pace of In Our Mad and Furious City is quick and makes for a seamless read. The sections with each character are brief before cutting to the next. It keeps the reader ‘on their toes’ but is also a source of frustration. The one detraction I found in this book was the fact that Gunaratne usually only stays with a character for a few pages before jumping to the next. The reader is not allowed to settle and form a connection with a character and is suddenly given another one to journey with. It may well be that this is intentional and is supposed to reflect the madness and fury of this kind of London. It is easy to see why Guy Gunaratne’s debut effort is receiving the attention it is. The writing style is fresh, colourful and varied in a way that feels genuine. While there are minor detractions, they are trumped by the pace and poetics of Gunaratne’s writing.